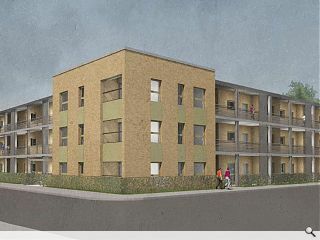 Thenue Housing Association have lodged proposals to build 27 flats at Landressy Place, Bridgeton, as part of an ongoing regeneration drive for the east end district. 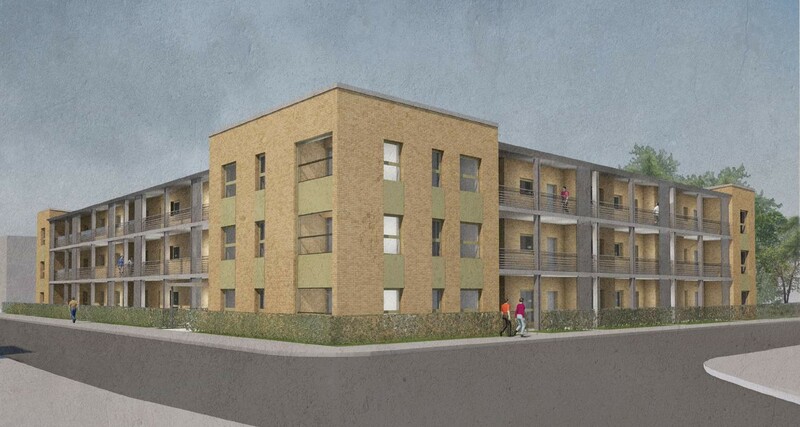 The three-storey development has been designed by John Gilbert Architects to Housing Varying Needs standards which includes a 10% allowance for wheelchair accommodation as well as measures to foster social interaction. Attention will also be paid to people living with dementia with closes decorated to create a floor to floor identity within the building including high level covered walkways to the north and east. Formed from a timber structural frame clad in brick and laminated panels with concrete and steel walkways the project aims to present a ‘robust’ elevations to the street. All that good work down at Bridgeton, and then this. Aha, this is just what Bridgeton needs - back to front housing with deck access to the street. That'll be nice. There's lots of really good examples of that typology working well in Glasgow. No, wait! Flatpack dross -- phoned in by someone who has better things to do. Really poor with no presence or personality. Looks like a middle income Bar-L proposal -- but without the walls to hide its sins. What is going on just now? Miserable ideas from the 70s getting rehashed all over Scotland on a weekly basis. Gallery access in Glasgow! Nae chance!